In most fiber optic network, dual-way transmission is necessary, which is usually achieved via duplex fiber cable. However, in some cases, simplex fiber cable can also support dual-way transmission like network that uses BiDi modules. 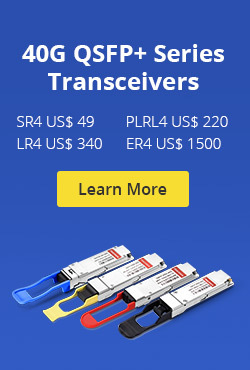 For instance, if you used a pair of BiDi fiber optic transceivers with one using 1270nm for TX and 1310nm for RX, the other BiDi module should use the same but reversed wavelengths for TX and RX on the other end of the fiber link. Thus, a pair of dual-way signal can be transmitted on the same fiber via two different wavelengths. When it comes to build a single-fiber CWDM network, things will be a little different. However, the basic principle is similar, which is using different pairs of wavelengths to transmit different pairs of dual-way signal. 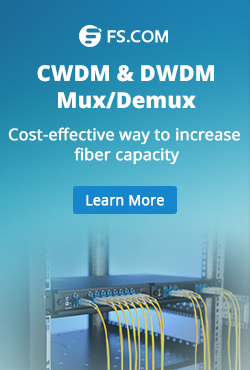 To build a CWDM network, CWDM MUX/DEMUX should be deployed on each end of the fiber optic link. There is also single-fiber CWDM MUX/DEMUX which is used to combine different wavelengths over the same fiber for dual-way transmission. Unlike dual-fiber CWDM MUX/DEMUX which uses the same wavelength for a pair of dual-way signal transmission, single-fiber CWDM MUX/DEMUX uses two different wavelengths for each pair of dual-way signal. 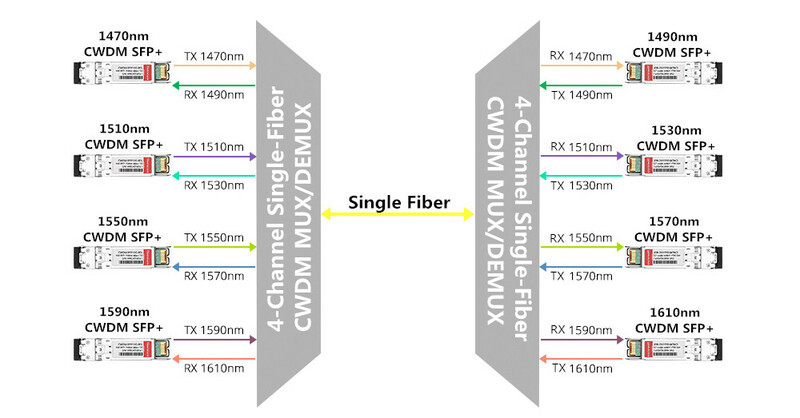 A 4-channel dual-fiber CWDM MUX/DEMUX only uses four different wavelengths. However, a 4-channel single-fiber CWDM MUX/DEMUX will use eight different wavelengths which are divided into four pairs for dual-way transmission. The above picture shows a 9-channel single-fiber CWDM MUX/DEMUX which uses 9 of the CWDM wavelengths for transmitting and the other 9 CWDM wavelengths for receiving. There are one simplex line port and 9 duplex channel ports loaded on the front panel. And each duplex channel port uses two different wavelengths which are clearly marked on the front panel. The following picture is also a 9-channel single-fiber CWDM MUX/DEMUX which is used together with the above one. However, the ports for TX and RX are all reversed to ensure the dual-way transmission. To build a single-fiber CWDM network, CWDM fiber optic transceiver installed on devices like switches is usually connected to the channel port of CWDM MUX/DEMUX. However, as the channel port on the single-fiber CWDM MUX/DEMUX support two different wavelengths. The selection of CWDM fiber optic transceivers for this type of MUX/DEMUX might be confusing. Actually, it is quite simple. You just need to consider about the wavelength TX (transmitting) port. For instance, if one of the duplex port uses 1270nm for TX and the other use 1290nm for RX, then the a 1270nm CWDM transceiver should be used for this ports. While on the other end of this link, a 1290nm CWDM transceiver is required. The following picture shows a 10G 4-channel single-fiber CWDM network which can better illustrate how to use single-fiber CWDM MUX/DEMUXs and how to select CWDM fiber optic transceivers for single-fiber CWDM MUX/DEMUX. Each wavelength just runs on one direction in single-fiber CWDM network. Connecting the CWDM fiber optic transceivers installed on switches with the correspond channel ports on the single-fiber CWDM MUX/DEMUX and connect the line ports of the two CWDM MUX/DEMUXs via single-mode simplex fiber, a simple single-fiber CWDM network can be built. The above content just offers the basic concept of how a single-fiber CWDM network is like. There are actually a lot of factors to be considered during practical deployment, like light loss, transmission distance, and optical signal dropping and adding. IF you are interested, kindly visit FS.COM for more details. This entry was posted in CWDM & DWDM Mux Demux, How To, WDM Optical Network and tagged single-fiber cwdm, single-fiber cwdm mux/demux, single-fiber cwdm network on December 21, 2016 by Alice Gui.